A laptop computer with details of 109,000 members of six pension schemes has been stolen from offices in Marlow in Buckinghamshire. The theft took place on 23 March, from the offices of a computer software firm called NorthgateArinso. It provides software to the Pensions Trust, which runs pension schemes for charities and voluntary organisations. The theft has been reported to the police and is the latest in a long line of similar cases. The data was protected by a password and was "not easily accessible" said the Pensions Trust, which said it was sorry the laptop had been stolen. However the data, which was not encrypted, included names, addresses, dates of birth, employer, national insurance numbers, salary details and, in the case of those receiving their pensions, their bank details too. "The Pensions Trust has now withdrawn access to personal member data from NorthgateArinso and have also instructed them to delete any existing personal member data they hold," said spokeswoman Lynda Howe. "We are hopeful that this incident will not have any impact on members but, as a precaution, we have arranged for them to be protected by CIFAS (the UK fraud prevention service) and have set up a members' helpline," she added. 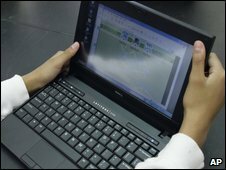 The data on the laptop was accurate as of May 2007 and was being used for training and developing new software. A spokesman for NorthgateArinso said the laptop had been stored in a locked room, and had not been left lying around. "Everything points to this being an opportunistic theft and there is no evidence that any of the data on the laptop has been used or even been accessed," he said. "NorthgateArinso is working closely with the police in their ongoing investigations and has also hired security specialists to investigate the theft and review our security measures." The people whose data was stolen were members of six of the 39 pension schemes administered by the Pensions Trust. The information commissioner's office said it was taking the theft very seriously. "Any organisation which processes personal information must ensure that adequate safeguards are in place to keep that information secure," said a spokesman. "We will be contacting the Pensions Trust to establish how this security breach occurred and to find out what steps it will be taking to ensure that such a breach cannot happen again," he added. Last October a laptop containing personal details of more than 100,000 members of the Network Rail and British Transport Police pension schemes was stolen from the accountancy firm Deloitte. The month before, the Ministry of Defence lost data about 100,000 of its personnel. The most spectacular loss of personal information came in November 2007, when HM Revenue and Customs (HMRC) lost two computer discs. They held the entire child benefit database, including the personal details of 25 million people, covering 7.25 million families.